Clare McCabe, professor of chemical and biomolecular engineering, has been appointed associate dean of the Graduate School and director of the Office of Postdoctoral Affairs, Mark Wallace, dean of the Graduate School, announced today. The appointment was made effective Jan. 1. The Office of Postdoctoral Affairs was established within the Graduate School late last year to coordinate the oversight of postdoctoral programs and support the needs of the more than 500 postdoctoral scholars working throughout the university under the aegis of a single shared office. As the inaugural head of this new office, McCabe is charged with building out a number of its core functions and services. She will coordinate with Vanderbilt’s Postdoctoral Association, a postdoc-led networking and career development group, to facilitate further enrichment opportunities as well, such as coordinating seminar exchanges with postdoctoral associations at other research universities. Another important item on McCabe’s to-do list is to begin tracking outcomes of current and former postdocs in greater detail to ensure the office is providing these researchers the right tools for success in their future careers, both academic and otherwise. 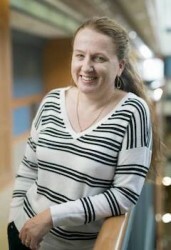 She’ll also work closely with the School of Medicine’s Biomedical Research and Training Office of Postdoctoral Affairs, which already offers a robust range of services and activities to biomedical postdocs, in order to identify best practices that can serve the broader university postdoctoral community. McCabe will also oversee the rollout of the Provost’s Academic Pathways Fellowship program, a new initiative to prepare early-career researchers from diverse backgrounds for academic careers. She is a co-principal investigator on a $2 million NSF grant to pilot the Academic Pathways model for STEM researchers, with a focus on women of color. The first cohort of Academic Pathways scholars will arrive on campus this fall. Prior to this appointment, McCabe mentored a number of postdoctoral researchers and served as the director of graduate studies for the Department of Chemical and Biomolecular Engineering. She holds a secondary appointment in the Department of Chemistry.